The French government says it fears “major violence” in Paris on Saturday as the national “yellow vests” protest movement shows little sign of easing. The government said it was scrapping the fuel tax increases in the budget – the original spark for the protests. But broader discontent with the government has spread, and protests have erupted over several other issues. On Thursday, more than 140 people were arrested at a single protest about proposed reforms to the school system. The rally, in Mantes-la-Jolie in Yvelines, ended in clashes with police in front of a school, reports said. Dozens of other schools were blockaded in cities like Marseille and Paris. Meanwhile, Saturday’s planned rally of the yellow vests looks set to go ahead. Recent protests have turned violent, causing millions of euros in damage. How has the prime minister responded? Speaking before the French senate, Prime Minister Édouard Philippe said “exceptional means” would be used on Saturday in addition to 65,000 police officers on duty across France. Confirming that the fuel tax had been abandoned, he told senators that the calm of most protesters around the country contrasted with the “extreme violence” seen in Paris. According to French media, Mr Philippe will decide on Saturday whether to deploy armoured vehicles to clear roads in Paris if barricades are erected. Such a deployment has not taken place since 1968.
Who are the ‘gilets jaunes’? What is the government worried about? The protest on Saturday 1 December descended into the worst rioting seen in decades, with hundreds of injuries and arrests. However, without any central structure or official leaders, extremists and “troublemakers” are suspected of joining the rallies and inciting violence, the interior minister said earlier this week. Sources at the presidential palace expressed the government’s concern about continued violence on Wednesday night. The expectation of unrest led public institutions such as museums to announce their closure on Saturday. A series of football matches have also been postponed at the request of police or local authorities. They include those between Paris and Montpellier, Monaco and Nice, Toulouse and Lyon, and Saint-Etienne and Marseille. How are the protests spreading? The yellow vests protests have moved beyond the initial anger about fuel taxes. Last week, the movement – despite a lack of central leadership – issued more than 40 demands to government. The government has already acknowledged some of the concerns, suggesting it may review the “wealth tax” it abolished after taking power. An analysis of its original budget plans for 2018-2019 showed it benefitted the very wealthy rather than the very poor. One police union, Vigi, called for a strike of its administrative staff working in the interior ministry for Saturday – saying that without the support of such staff, riot police would be immobilised. “Our hierarchy still sends us to take a beating instead of the government,” the union said, calling for solidarity with the yellow vests. What are the student protests about? Thursday saw young people take to the streets, protesting over educational reforms. President Macron’s government hopes to change the end-of-school exam, known as the baccalaureate, which is required for entrance to university. It was brought in under Napoleon more than 200 years ago, and any passing student is entitled to attend their local university – where a large number do not complete their first year. Mr Macron’s plan could allow universities to select students on merit for the most popular courses – but critics fear that will limit opportunity and breed inequality. 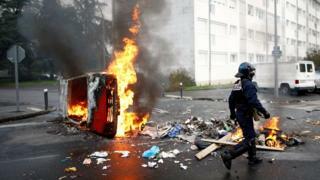 In Nantes, young demonstrators overturned vehicles and bins, and set fires. French daily Le Monde, however, drew a line between the two groups, suggesting that long-standing discontent over the proposed education reforms had been given a boost by the success of the “yellow vests”. The Union Nationale Lycéenne, representing secondary school students, has called for a “great mobilisation” of schools on Friday. Another part of the university, Sorbonne Nouvelle – known as Paris 3 – also remains closed.